Worksets facilitate the worksharing process, which allows team members to work on different parts of the project simultaneously. This is a basic Revit feature and sort of happens in the background. As such, Worksets are not something that I think about very much. If I had to guess, I would say that the average Revit user does not think about them much either (if at all). And that is probably a good thing, since we have plenty of other things to think about. But if you are setting up a brand new Landscape Revit Template, then it might be more of an issue. So, what are some common standards for making new (user-created) Worksets, and how does this apply to the landscape? Steve Stafford’s post on Revit OpEd, How Many Worksets Do I Need?, does a good job of addressing many of the questions that may arise when creating new Worksets. 1. Just use 1 main Workset for most model work. Exceptions to this would be a particularly large or complex site that might need additional Worksets to function or even a project that has specific phasing requirements. 2. See how other project team members (specifically the architects) are using Worksets and apply that to the landscape. If you’re interested, here is an example of the typical, default Worksets that I have used in the past. 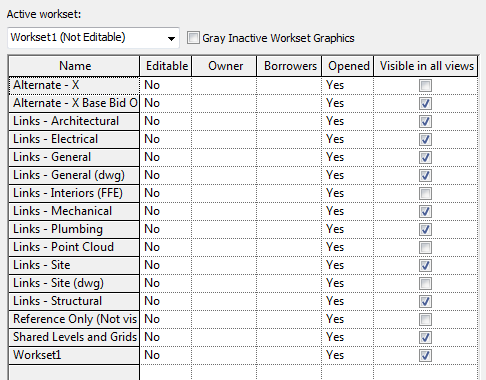 Almost all work was done on Workset1, with Revit links and dwg links having their own Worksets. Alternates (and Base Bid) would frequently (though not always) be split off into a separate Workset. Though it is not shown, I would also recommend having separate Worksets for landscape dwgs and civil dwgs (or civil Revit links, if applicable). I think there’s also the possibility to add WS as a Layer modifier in the DWG export setup. If you for example need to separate objects of the same category into different cad-layers.